Announcement Paper Flowers, Paper Flower Walls, Wedding Decor, Nursery Decor, Party Backdrops, Kissing Balls, Flower Balls, Flowers, Art Pieces And More! If you are looking for something custom or are interested in larger quantities, send me a convo and I would love to work with you!! 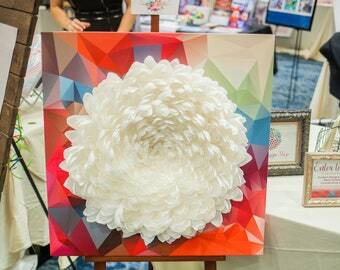 Paper Flowers, Paper Flower Walls, Wedding Decor, Nursery Decor, Party Backdrops, Kissing Balls, Flower Balls, Flowers, Art Pieces And More! Trista did such an amazing job! I asked for a custom color for the tinted flowers to match my wedding theme and she nailed it. Gray, Yellow and White The ultimate neutral color combo! Leave me with your color combo preferences and I'll create flowers you will love forever! The perfect accessory to any nursery! I love working with a variety of papers...crepe, text, card stock, etc. Roses for any occasion!! Gifts, events, decor, etc. Color Galore!! I've been working since I was 16 years old, but the real story all started when I was a full time employee and parent. When I became a mom for the first time, I was juggling my career and my family, there wasn't much room for anything else. When I became a mom of two, the juggling was much more demanding and I felt I was neglecting a little bit of something from everything; my career, my family, my husband and even myself. Now it's been about eight years and I have been able to give myself to my family, AND I've been given the opportunity that a lot of people don't have, to create and design my own work. I schedule my own hours and I have no restraints on my creativity. I'm able to put my work aside if I'm needed for a doctors appointment, a baseball game or just time with the family. I am blessed! I am a SAHM with a passion for design. I love to create accessories for everyday apparel and home decor. I would love to work with you for your fashion and home decor needs! A DTG (direct to garment) printing shop. I would like to start off by saying thank you for stopping by and checking me out! My Sparkled Life was originally created to replicate the dream of living a luxurious life all the while maintaining my WAHM (Work At Home Mom) status. All items in my shop are all lovingly crafted and handmade by me. I'm in love with boutiques and have set high expectations to guarantee my products resemble the best of the best. If you notice a shortage of product, just wait, I am in the works of something great to come. Refunds and/or exchanges must be made within 7 days of delivery. Customer to pay for return mail. I take great pride in my work and will make every effort to guarantee you are happy with your purchase! I do charge sales tax for all purchases shipped within the state of Texas. Non Custom Orders usually ship out within 1-2 business days via USPS First Class or USPS Priority Mail; however, if you would like to ship via a different method, please contact me and I’ll be more than happy to work with you (additional shipping fees may be applied). Custom Orders are individually quoted a shipping time and price. Here at My Sparkled Life, I hope to be able to create a great relationship with you!! If you have any suggestions, questions or comments, please feel free to let me know what is on your mind. Paper flowers will last forever with little effort. 1.) The most important thing to remember is paper flowers are not waterproof, so keep them dry! 2.) Light feather dusting is all that is needed in order to keep your flowers clean. No cleaning products needed. How do I hang the wall paper flowers? My personal preference that I use are the flat thumbtacks. I always tell my clients to use the tacks on the inside bottom part of the back petals (as far down as you can go). The tacks are invisible and secure the flowers in place. They won't budge until you're ready to move them yourself. 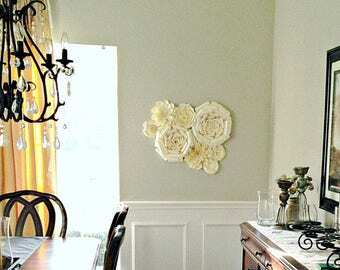 Another option is to use any kind of wall hanging adhesive (Command Strips, Gorilla Tape, 3M, etc.). These are a good option for anyone not wanting to put pin holes in the wall. The only reason I don't prefer these over thumbtacks is because if you use them once, they are not as reusable. Their stick strength is compromised and will most likely need a new adhesive strip. If you still need help hanging your flowers let me know, I'm happy to help! !